Marlins second baseman Starlin Castro has cleared revocable trade waivers and is now eligible to be dealt to any club, reports SiriusXM’s Craig Mish (Twitter link). Castro, 28, is still owed the balance of this season’s $10MM salary (roughly $2.19MM) in addition to next year’s $11MM salary and a $1MM buyout of a $16MM option for the 2020 season. In total, Miami still owes him a fairly sizable $14.19MM through the end of the 2019 campaign. Given the team’s salary-shedding measures in the 2017-18 offseason, it’s possible that the Marlins would’ve been happy to simply let another club pick up the remainder of that tab and further clear payroll, so it’s not a huge surprise to see him go unclaimed. That’s not to say that Castro is overpaid, though. He’s more than lived up to his contract thus far in 2018, hitting at a .287/.335/.407 clip with 10 homers, 26 doubles and a triple while playing roughly average defense at second base. While other clubs may not be keen on absorbing the remainder of his salary obligations at this time of year, especially with few contenders in the market for second base upgrades, the Marlins could potentially drum up some interest if they express a willingness to offset some of that salary. The Indians, in particular, have been connected to some second basemen on the rumor circuit in recent weeks, though there’s been nothing to suggest that Cleveland (or any other club) has any substantial interest in Castro. To that end, Barry Jackson of the Miami Herald reported earlier this month that the Marlins didn’t receive any serious interest in Castro prior to the non-waiver trade deadline. Castro doesn’t seem especially likely to move even after today’s report, but even if he stays put, the Miami front office figures to gauge interest in him (and other shorter-term assets) once again this offseason as it continues to take a long-term approach to rebuilding the organization. The Mets made repeated inquiries on Marlins catcher J.T. Realmuto during the offseason, says Ken Rosenthal of The Athletic in a video tweet. They also asked the Marlins about Starlin Castro. However, at that point in the winter, the club had just traded Christian Yelich to the Brewers, and they had also unloaded the contracts of Dee Gordon, Giancarlo Stanton and Marcell Ozuna; they weren’t looking to cut any more salary at that moment in time. While the Mets are prepared to roll with Tomas Nido and Jose Lobaton for now, Rosenthal suggests that the club could attempt to revisit Realmuto discussions at some point. Although it’s early, Rosenthal suggests that Mike Moustakas looks like a hot trade candidate, citing his physical condition and low salary as selling points for the Royals third baseman. According to GM Dayton Moore, Moustakas is “running as well as he ever has.” Rosenthal figures that Kansas city will be among the most active trade deadline sellers in July, and could also dangle southpaw Danny Duffy, second baseman Whit Merrifield and closer Kelvin Herrera. The shifting power structure of Orioles ownership might affect the way the club approaches a potential Manny Machado trade, should they end up willing to deal him. Peter Angelos was always opposed to making trades with the division-rival Yankees, but the younger Angelos’ might not place such a restriction on the concept. There are a number of other reasons to throw cold water on the idea of a Machado-to-Yankees swap, as Rosenthal notes, such as the presence of Brandon Drury and the Yankees’ possible focus on pitching. Still, the idea seems more plausible now that Peter Angelos’ sons are more active in the running of the club. One rival executive estimates that there are “tens of millions” of dollars riding on the health of Blue Jays third baseman Josh Donaldson’s shoulder. Rosenthal posits that the former AL MVP will be much less valuable as a free agent if there are questions surrounding his ability to play third base; much of his value lies in his defensive prowess. Being viewed as a first base/DH type for the bulk of his remaining career could eliminate some NL teams as suitors, and it doesn’t help that Donaldson is about to turn 33. 1:33pm: The Major League Baseball Player’s Association has raised concern with the commissioner’s office regarding the Marlins and Pirates, according to Barry Jackson of the Miami Herald. Yahoo’s Jeff Passan had recently reported that the union was considering the idea of going to commissioner Rob Manfred with their concerns. As Jackson notes, it wouldn’t be the first time that revenue-sharing concerns regarding the Marlins were raised. A similar scenario occurred back in 2010, at which point Miami did (briefly) increase its spending; the Marlins rolled out their first $100MM+ payroll in 2012, the debut season of a taxpayer-funded stadium in Miami, only to conduct a massive firesale the following offseason. Neither the Marlins or Pirates have signed a free agent to a Major League deal this offseason; instead, the teams have been largely focused on trading away big league assets. Miami has shipped out Giancarlo Stanton, Marcell Ozuna, Dee Gordon and Yelich, shedding more than $40MM of payroll in the process. Even with all of those dealings, the Marlins still haven’t reached their target of a $90MM payroll, though moving Castro (and possibly Realmuto) would get them to said point. The Pirates, meanwhile, have traded Gerrit Cole and Andrew McCutchen, though their focus on acquiring MLB-level assets and the remaining presence of players like Starling Marte and Gregory Polanco seemingly indicates that they’re not embarking on an aggressive tanking endeavor in the same manner as the Marlins. Pittsburgh seems like a better candidate to step out into the open market and add a mid-range player or two. Beyond the aforementioned focus on MLB-ready assets is the fact that the Pirates have recently opened the season with payrolls in the $95-100MM range but currently projects to just a bit over $85MM in 2018. Obviously, no one would expect Pittsburgh to be a player for a top-tier free agent, but a modestly priced upgrade for the back of the rotation, the outfield or the bullpen nonetheless seems plausible. 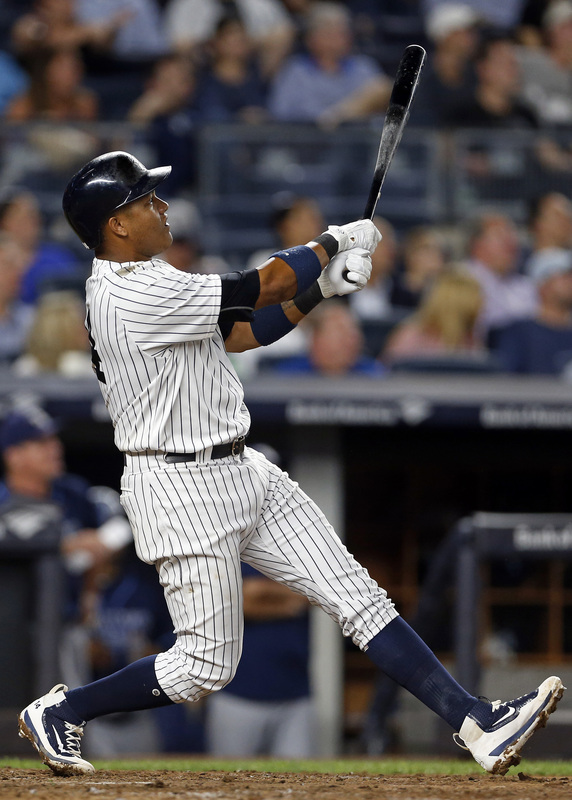 Middle infielder Starlin Castro has collected four All-Star appearances, 1,280 hits and a rich contract since he made his major league debut in 2010. It’s fair to say Castro has lived pretty well during his big league tenure, then, though team success has been difficult to come by for the 27-year-old. Castro spent the first six years of his career with the Cubs, who only went to the playoffs once during that span. That season, 2015, proved to be Castro’s last in Chicago, which traded him to the Yankees during the ensuing winter. Less than a year later, Wrigleyville celebrated its first World Series title in 108 years. The Yankees didn’t qualify for the playoffs in Castro’s first year in the Bronx, but they bounced back to play deep into October last season and take the eventual champion Astros to seven games in the ALCS. That looked like the beginning of what could be a long run of success for the talent-packed Yankees, but it was also the end of Castro’s run with them. Not only did the Yankees trade Castro after the season, dealing him and two prospects to the Marlins for 2017 NL MVP Giancarlo Stanton, but they sent him to a team that hasn’t won in years and won’t in the near future. The Stanton trade was primarily a payroll-cutting move by Miami, which later shipped fellow star outfielder Marcell Ozuna to the Cardinals. Now in the early stages of an extensive rebuild, the Marlins’ already lengthy playoff drought (14 years) is likely to drag on for at least a few more seasons. Castro, having had his fill of losing, would reportedly like to leave the Marlins before ever taking the field as a member of the franchise. With a guaranteed $22MM left on his contract through 2019, his only hope of escaping the Marlins in the near term is via trade. It’s unclear whether the Marlins are interested in dealing him, but it stands to reason they’re open to it, given that slashing costs seems to be the main motivation of neophyte owners Bruce Sherman and Derek Jeter right now. The trouble is that obvious fits for Castro, a longtime shortstop who lined up exclusively at second base as a Yankee, are hard to find. His All-Star nods notwithstanding, Castro has been more of an average player than a high-impact one in the majors, having slashed .282/.320/.413 (97 wRC+, 98 OPS+) and totaled 14.2 fWAR/13.5 rWAR across 4,847 plate appearances. His contract offers little to no surplus value, then, and there simply isn’t much league-wide demand right now at either short or second (where similarly valuable players in Eduardo Nunez and Neil Walker are still free agents). Astros – Five words: Jose Altuve and Carlos Correa. Cubs – With Addison Reed, Javier Baez, Ian Happ and Ben Zobrist in the fold, a Castro-Cubs reunion isn’t happening. Diamondbacks – Castro would be the most proven middle infielder on the Diamondbacks’ roster, but they still have enough acceptable options with potential breakout player Ketel Marte, Brandon Drury, Chris Owings and Daniel Descalso on hand. The D-backs have pushed to acquire shortstop Manny Machado from the Orioles this winter, though he’s a transcendent player who’d greatly improve their chances of returning to the playoffs in 2018. Castro isn’t in that class. Dodgers – The great Corey Seager occupies short, but the Dodgers could do better than Logan Forsythe at second. Castro’s hardly a slam-dunk upgrade over Forsythe, though, and his salary would be problematic for a Dodgers team trying to stay under the $197MM competitive balance tax figure. Indians – The Tribe’s not in position to pick up Castro’s money, nor does it need to, with Jason Kipnis and Jose Ramirez as its primary second base options and Francisco Lindor at short. Red Sox – Boston has also shown interest in acquiring Machado, but he’s more of a luxury than a necessity for the back-to-back AL East champs. The Red Sox are fine at shortstop with Xander Bogaerts, after all. They could perhaps use a second baseman to fill in for Dustin Pedroia, whose offseason knee surgery will keep him on the shelf for some of 2018. Castro doesn’t make sense for the BoSox, however, as a healthy Pedroia will relegate his replacement to the bench or a utility role. Nationals – Few teams are in better shape up the middle than the Nationals, who boast Daniel Murphy at second and Trea Turner at short. Rockies – There’s nothing to suggest the Rox are dissatisfied with the cost-effective duo of second baseman D.J. LeMahieu and shortstop Trevor Story. Twins – Minnesota has a much better second baseman than Castro in Brian Dozier. Elsewhere, the Twins aren’t going to move 24-year-old Jorge Polanco off shortstop for Castro – who hasn’t played the position since 2015. Yankees – Over a month since acquiring Stanton, the Yankees still haven’t replaced Castro with an established second baseman to complement shortstop Didi Gregorius. Whether they’re all that interested in doing so is unclear, given the presence of elite prospect Gleyber Torres. Even if the Yankees don’t think the 21-year-old Torres is quite ready, and even if they like Castro enough to attempt to re-acquire him, financial concerns could stand in the way. The Bombers parted with Castro to help balance out money in the Stanton trade and keep them under the $197MM tax number in 2018. Staying south of that figure continues to be one of the Yankees’ driving forces, so the Marlins would likely have to swallow some of Castro’s money in a trade to make a reunion possible. As for non-playoff teams from 2017 that may hope to contend this year. . .
Angels – The Halos already traded for veteran second baseman Ian Kinsler this winter, and they have all-world shortstop Andrelton Simmons. Athletics – The A’s have been open to trading second baseman Jed Lowrie this offseason, though dealing him just to turn around and get Castro wouldn’t seem to make sense. Rather, a Lowrie trade would likely open the door for a Franklin Barreto–Marcus Semien double-play tandem. Blue Jays – On paper, Castro may have been a fit for Toronto at the outset of the offseason. However, the Jays have since addressed their middle infield by acquiring Aledmys Diaz and Yangervis Solarte – two players capable of holding the reins if injury issues once again beset Troy Tulowitzki and Devon Travis. Braves – The presences of middle-infield building blocks Ozzie Albies and Dansby Swanson rule out a Castro acquisition. Brewers – There might be a match here. The Brewers do have second base-capable veterans in Jonathan Villar, Eric Sogard and Hernan Perez, but only Sogard had a decent 2017 at the plate. Although, if the Brewers do pick up another vet for the keystone, they could opt to re-sign Walker – who thrived with them late last season after coming over in a trade – instead of swinging a trade for Castro. Cardinals – If the Cards are going to trade for an infielder this winter, it’s likely to be a corner player who provides an impact bat. That’s not Castro, who wouldn’t be a clear upgrade over second baseman Kolten Wong or shortstop Paul DeJong. Giants – San Francisco’s another team without a need in the middle infield, where it starts Joe Panik (second) and Brandon Crawford (short). Mariners – Unless trade-happy GM Jerry Dipoto acquires Castro to play the corner outfield (you never know), he won’t end up in Seattle. The Mariners are set all across the infield. Mets – As with the Brewers, the Mets are prospective contenders who could stand to improve their situation at second. While New York has been in the market for aid at the position this offseason, multiple reports have suggested it has no interest in Castro. Orioles – The O’s are in enviable shape at second with Jonathan Schoop, and they’ll go with Machado (if he’s still on their roster) or Tim Beckham at short. Phillies – Phillies second baseman Cesar Hernandez has been an oft-speculated trade candidate for a couple years. He’s superior to Castro, though, and even if the Phillies do move Hernandez, they’d likely replace him with prospect Scott Kingery. At short, they’ve given the keys to J.P. Crawford. Rangers – There won’t be a Castro pickup for the Rangers, who have the well-compensated tandem of Rougned Odor (second) and Elvis Andrus (short) in starting roles. Rays – Castro may well be better than all of the Rays’ current middle infielders, Adeiny Hechavarria, Brad Miller, Matt Duffy and Joey Wendle. The problem is that Tampa Bay is aiming to reduce payroll, which makes a Castro acquisition look highly unlikely. They also have one of the premier middle infield prospects in baseball, shortstop Willy Adames, nearing the majors. Beyond the aforementioned clubs, we’re left with the Royals, Tigers, White Sox, Padres, Reds and Pirates. Like Miami, both Kansas City and Detroit look to be in the early stages of a rebuild, which should stamp out any potential of a Castro pickup. The AL Central rival White Sox don’t figure to contend in 2018 either, and they’re certainly not going to displace either of second baseman Yoan Moncada or shortstop Tim Anderson. The Padres also have no shortage of big league middle infielders, even after trading away Solarte, with Cory Spangenberg, Carlos Asuaje and the recently acquired Freddy Galvis in the mix. The same goes for the Reds (Scooter Gennett, Jose Peraza, Dilson Herrera and Nick Senzel). The Pirates, whose Gerrit Cole trade on Saturday may signal the start of a rebuild, have plenty of options themselves (Josh Harrison, Jordy Mercer, Adam Frazier and Sean Rodriguez). They could trade Harrison, but they wouldn’t do so in order to make room for the similarly expensive Castro. Unfortunately for Castro, this doesn’t appear to be the right time for a roughly average second baseman who’s not cheap to push for a trade to a contending club. Teams like the Yankees, Brewers and Mets could certainly improve their second base situations by Opening Day, though none are clean fits for Castro. As such, he may have to at least begin the season in Miami, where a strong few months could potentially boost his trade value and lead to a deal by the summertime.